white crocus, originally uploaded by jahansell. Notice the snow? It's gone now (this photo was from yesterday) but it's still cold and Sunday we're getting a big nor'easter. Tomorrow, at least, it's supposed to be pleasant. For a while. Relatively speaking. Sigh. I need some sun! I think when I lived briefly in the northern hemisphere (England) I can remember my mood lifting significantly at the first sight of crocuses and coming spring! This photo is lovely and a great mood-shifter! I agree with Carol. i was about to say the same. she beat me to it. 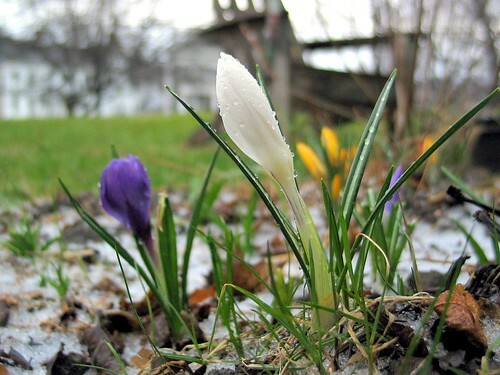 The ground is shaking with the growth of spring. It's all going on uner the soil. Wish I could whisk you over here, we've had a wonderful sunny day. Well, this is spring, with these beautiful flowers and the promise of more spring colour from Sharon!